I think I can safely say that was one of the best episodes of the show in quite a long time. While I did enjoy last season's Fan Fiction, if anything this episode was even more of a celebration of the show by focusing on ostensibly the third main character of the show that has been around since day one - the Impala. As Sam says at the end of this episode, the baby is their home more than anything else has been. Anyway, let's get on with what actually happened this episode. I actually enjoyed the flash forward opening of this episode. 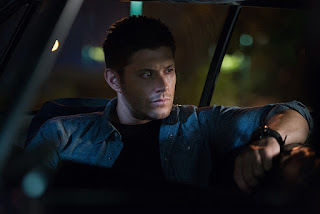 Normally I think that's a bit of a cop out because it's done so often now, but I thought it did a good job of making me wonder what had happened to leave Dean beaten up in the back of the car, handcuffed, with the back window shot out. But before that, he was back at the bunker washing the car. With nothing to go on with the Darkness or Metatron, Sam suggested a possible case in Oregon (whaaaat Oregon!). Dean was all for the distraction, so it was time for a road trip, which resulted in a nice stop over at a Roadhouse where Dean spent all night with some girl from a past hunt, and Sam apparently went and hooked up with a girl in the backseat of the car. Rarely do we see Sam picking up random girls, so both Dean and the audience was somewhat delighted. Back on the road, we get a little road trip singing action, followed by a completely unexpected scene for me. 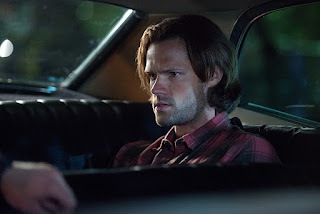 I wasn't paying attention to the guest stars at the beginning of the episode, so when Sam woke up in a dream/vision thing and saw his young dad driving him, I was like what! Of course, it wasn't really our dearly departed John Winchester, but rather someone else warning Sam that the Darkness is coming, and he and Dean are the only ones who can stop it. Sam asks for, you know, some kind of actual clue to do that, but he just says "God helps those who help themselves." So... ultra helpful. Sam tells Dean about this dream/vision, but Dean isn't convinced that this could be GAHHG* helping them out. They have a nice little moment in the car discussing some of the recurring dreams they have about a regular life with their parents, then it's off to Oregon to figure out what's going on with the case. After talking to the local deputy, the boys head to a local restaurant, and the valet girl as the audacity to go joy riding in the Impala while they eat. 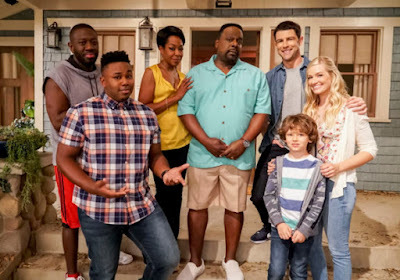 Which was the only odd thing about this episode to me, but I digress. The boys then part ways - Dean to investigate the crime scene and Sam to go speak to the wife of the victim. While Cas calls Dean to tell him what he's found in the lore, Dean gets a little more hands on experience with the monster, which turns out to be the deputy. He tries shooting it with silver, and even decapitating it, but neither works, so he sticks the head in a cooler and heads back to find Sam, who sticks the wife in the back of the car. They get another call from Cas, who has now figured out what they're dealing with - some kind of ghoul/vampire combo who can only be killed by sticking copper in its mouth. Allrighty then! Sam goes to find info or something, leaving Dean to get attacked by the wife, who is really part of a pack of these things. She knocks him out and drives the car back to the body of the deputy to reunite head with body. Turns out he's the pack leader. Dean manages to get himself out of the handcuffs thanks to the butterfly hair thing the girl Sam slept with earlier left in the car. Then he finds the pennies from the purse of the joyriding girl's friend and shoves them in the deputy's mouth. But not before poor baby got pretty much demolished with all of the fighting. In the end, Dean and Sam reunite in the Impala, ready to head back to the bunker to fix up the car and fight another day. - I definitely enjoyed this episode that was focused just on the boys and the car rather than all of the whole angel/demon/Darkness business. Definitely one of the best episodes of the last few seasons. - I read that they had to use all eight of their cars for this episode, and that some of them got quite beaten up and had to be fixed a lot. I can believe it with all of the shots they had to do. Some of them were a little funky, but it was a cool way to do the episode. Did you all enjoy it as much as me? - The only thing that bothered me was that it felt a bit convenient that the valet girl decided to randomly take the car for a joyride and her friend just happened to leave her purse, which just happened to have some old pennies in it. Suuuuure.... okay. - It was fun to see Sam actually get some. Does he get it on more than thought? Obviously Dean seems like a girl in every port sort of guy, but Sam... haha. Anyway. - This episode would definitely make it into the top 50 episodes that I did earlier this year. Dean (raining after he just washed the car): Figures. Dean: Never use Swayze's name in vain. Dean: Time heals all wounds, Sam. Especially good times. Dean: Mistakes were made. Mmm hmm. Sam: Don't "Night Moves" me. This was such an unexpectedly good episode! I loved how it was all shown through the Impala's POV- it made for a nice change. And Matt Cohen's name as guest star appeared only in the end credits, so that was a complete surprise. Great review as always. Cheers. Ah, ok. I wasn't paying attention but it's nice that they put Matt's name in the end credits so people weren't spoiled at the start of the episode. have to say that I am watching almost on autopilot at the moment but the filming angles and style language really grabbed my attention. I found the MOTW story was pretty ordinary (but funny) and the subtext rang loud and clear that this was about resetting and reseating the brothers story. I love Matt Cohen in this. I think he really nailed the John Winchester that Jeffrey Dean Morgan brought to the older and care worn character. And I am intrigued by the fear that the Monsters have of the coming darkness and even they believe that the Winchesters are their only hope. Agreed! With the best will in the world, anyone still on a show after 11 years must be aching for a new challenge and a little bored of reinventing the oft repeated.